This afternoon, Intel announced their earnings for the first quarter of their 2018 fiscal year, and once again, the company has set new records, with revenue for the quarter of $16.1 billion, up 9% from a year ago. Intel is always a company built on strong margins, and although they were down 1.3% from last year, at 60.6% they are still quite strong. Operating income was up 23% to $4.5 billion, and net income was up 50% to $4.5 billion, which is the same as their operating income because they had gains on equity of $643 million, and they paid only 11.1% in taxes for the quarter. Earnings per share came in at $0.93, up 53%. With numbers like that, it shouldn’t be a surprise that all of Intel’s business units improved their revenue year-over-year, including the Client Computing Group, which had revenues of $8.2 billion for the quarter, which was up 3%. It’s not a huge gain, but in a shrinking PC market, and stronger competition, they were able to scratch out some growth. Ryan’s going to go more into this in another piece, but Intel also made it official that they are not going to have any volume shipments of 10 nm until 2019. Intel is currently shipping low-volume on 10 nm, but continued struggles in getting the new process up to speed mean that any 10 nm products that were in the works are now going to be delayed again. Intel is going to continue to improve their 14 nm node for this year. Intel classifies the Client Computing Group as “PC-Centric” and you can see that it’s still the bread and butter of their revenue, but it’s also been stagnant for a while. They classify all of their other business as “Data-Centric” which includes the Data Center Group, IoT group, Non-Volatile Storage, Programable Solutions Group. 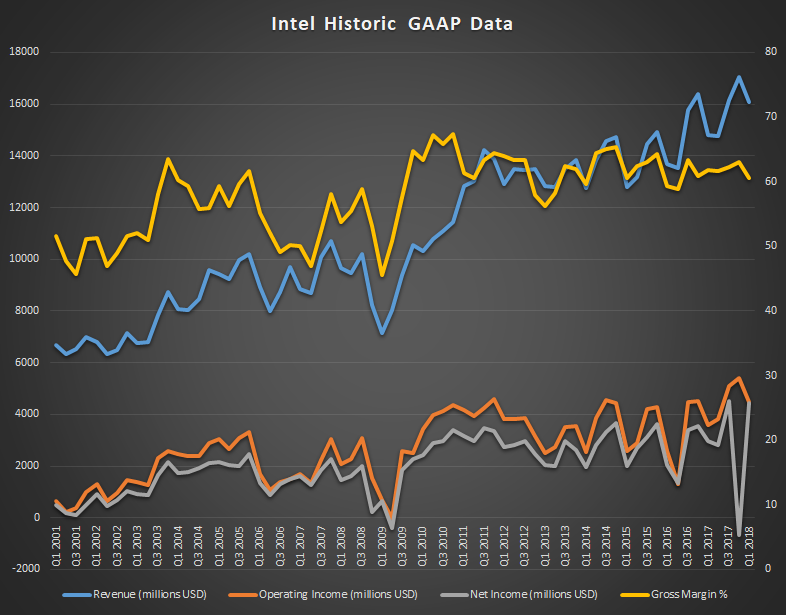 This Data-Centric aspect is why Intel is growing again. The Data Center Group had revenues of $5.2 billion, which is up 24% year-over-year. As we saw in AMD’s earnings, EPYC hasn’t really made an impact on their earnings yet, but Intel continues to dominate in this segment. IoT is closing in on the billion-dollar revenue for a quarter, with growth of 17% year-over-year to $840 million. Although Intel missed out on mobile, IoT has the potential to quickly surpass mobile, and they’ve committed to this space early, and are seeing strong growth. Non-Volatile Memory Solutions, which is Intel’s NAND flash and Optane group, had revenues of $1.0 billion for the quarter, which is up 20% year-over-year. They’ve focused a lot on the datacenter with their solutions, and there is higher margins there, so it’s not a surprise to see them focus in on that market. Programmable Solutions had revenues of $498 million for the quarter, up 17% year-over-year. This is another strong growth segment for Intel, and we’ve seen a lot of the cloud infrastructure trying to find ways to offload work onto FPGAs in an attempt for more efficient workloads. Thanks to the strong start, Intel has already raised their full-year expectations to $67.5 billion, which is an increase of $2.5 billion over their last forecast. Intel has traditionally led with their fabs, so it’s interesting to see them growing with such vigour when their fabs advances are completely stalled, but such is the growth of cloud computing. Most consumers don't really know or care about the performance loss since some of the patches arrived in february and then retracted and then new patches, and so on until april. So alot of confusion and q1 cannot reveal anything about that. Don't trivialize the issue. Otherwise the next time they may not even care about fixing such an issue, and we'll all be worse off. "Although Intel missed out on mobile, IoT has the potential to quickly surpass mobile, and they’ve committed to this space early, and are seeing strong growth." They just announced cutting off the wearables 'limb' and a lot of earlier IoT chips have been discontinued over the years. I agree, this is just Intel moving other business into what has traditionally been IoT to appear they are growing their TAM. LOL what are you smoking? We already know what you are eating and for that, you win the "Trump of the Month" and a toilet brush for your mouth!